Well, here we are on January 27th and I'm finally delivering one of those healthy recipes I promised! Sure, I can make grilled chicken and veggies with the best of them, but this is one of the first recipes I made that was both light on calories and super hearty; I promise you won't even miss the beef! I wasn't sure the meatballs would work with the 99% fat free turkey, but the ricotta cheese and egg helps keep the turkey moist and flavorful. 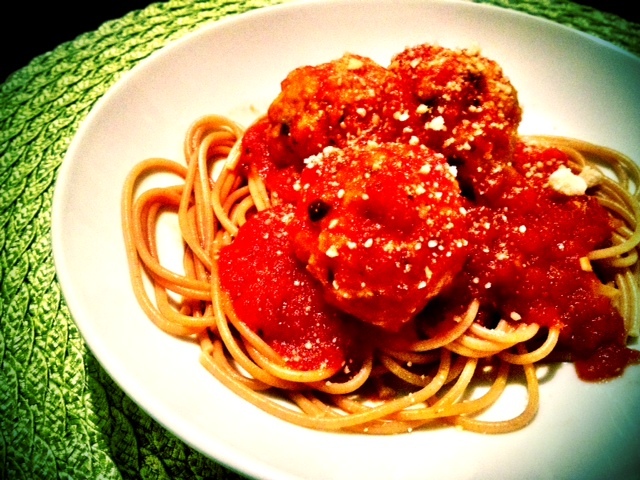 Serve these up with a little whole wheat spaghetti and you're all set! Preheat oven to 350. Prepare the tomato sauce by adding olive oil to a pot (you'll need one with a lid) and heat over medium high. Add onions to pan and sauté until the onions are soft (about 8 minutes, stirring often). Add garlic to onion mixture and sauté for 1 minute or so. Add remaining ingredients (if you prefer a smooth sauce, add all ingredients except bay leaf, simmer for a few minutes, then blend with an immersion blender; add bay leaf after blended). Reduce heat to low and let the sauce simmer. Line a baking sheet with parchment paper (or spray with cooking spray). To prepare the meatballs, combine all ingredients in a bowl. Using your hands, work the meat mixture until ingredients are well incorporated, being careful not to overwork it. Form into meatballs and place on baking sheet. Spray the tops of the meatballs lightly with cooking spray and transfer to the oven; bake for 20 minutes. After twenty minutes, carefully transfer the meatballs to the simmering sauce. Cover the pot and let the meatballs simmer until cooked through, about 20 minutes. Serve over pasta. Enjoy!